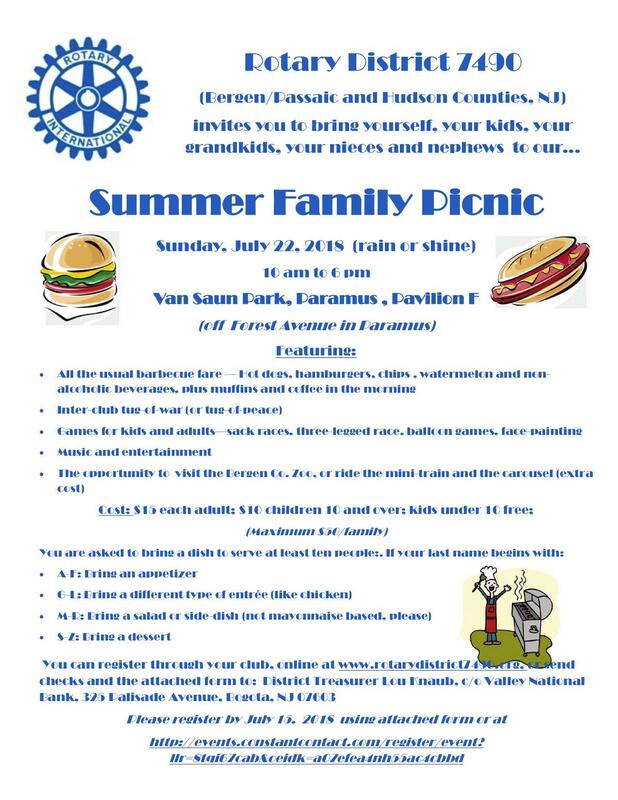 Get summer off to a great start by bringing your whole family to the Rotary District 7490 Family Picnic! Bring your kids, your grandkids, your nieces and nephews, your friends and get ready to enjoy a wonderful day in the park. Visit the zoo, ride the mini-railroad or the carousel, play family games or be part of an inter-District tug of war, enjoy entertainment. For breakfast, we'll have donuts and muffins and coffee. From lunch on, nosh on burgers, hot dogs, watermelon and beverages. We also ask that each family bring a dish that will serve eight people, according to the following: if your last name begins with A-F, bring an appetizer; G-M, bring a main dish (like fried chicken); N-R, bring a side dish (no mayonnaise. shellfish or peanut-based dishes, please); S-Z, bring a dessert. The adult cost is $15. Children under 10 are free. Children 10-17 are $10. We have a family rate of $40 for up to four people. Register online at: https://events.r20.constantcontact.com/register/eventReg?oeidk=a07efea4nh55ac4cbbd&oseq=&c=951ed940-4e4e-11e4-811e-d4ae52754055&ch=952282c0-4e4e-11e4-811e-d4ae52754055 .